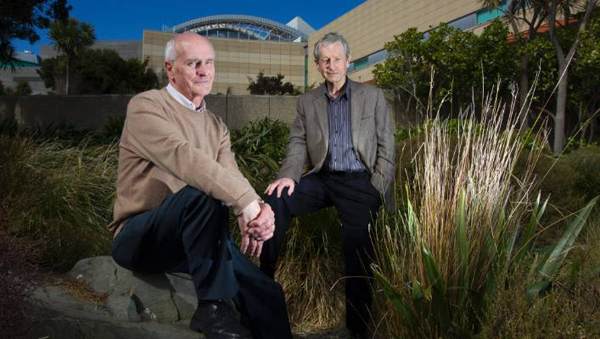 Scientists Mike Rudge, left, and Lionel Carter say the restructure further dilutes an already depleted science collection management team. It’s the smallest of sentences, but it hit Anton van Helden like a tonne of bricks. The second of three Te Papa restructure documents highlighted priority areas for the new structure: “key gaps are seaweeds, marine mammals, spiders”. Van Helden used to be that marine mammal guy. The guy who identified stranded whales. The guy who responded when a beach-walker wanted to know if they’d found the motherlode of sperm whale vomit, better known as ambergris. The guy who looked after the precious whale bones that were last year found covered in bacteria. But he got the boot in the national museum’s 2013 restructure. Now, another restructure threatens another tranche of collection management expertise and passion, which critics say is both crucial and irreplaceable. It’s also rekindled concerns about the country’s commitment to its nationally significant collections, which provide the key to understanding New Zealand’s past, present and future. To understand why Te Papa’s collections matter, you have to understand their purpose. New technology is constantly unlocking new possibilities for dusty flakes of history to reveal how the world is changing. Nic Rawlence, an Otago University lecturer in ancient DNA, spent three weeks in museum basements in Canterbury, Te Papa and Otago measuring old bones, to understand the shape of the giant swan that once roamed New Zealand. Te Papa’s collections are a treasure trove of New Zealand’s archaeological and natural history, he says. Mike Rudge looked after the national collections from 1994 to 1998. He remembers a visitor asking if a 1.4-metre, 1200kg fossil of an ancient ocean ammonite was a concrete replica. He’s all for digitisation and augmented reality, which could allow people to virtually swim with an ammonite. But there’s no replacing the real deal. Te Papa’s head of collections, Dale Bailey, doesn’t disagree. He rates the importance of Te Papa’s physical collections, including its 1.4 million natural history specimens, a 10 out of 10.